This week is Dementia Awareness Week 2016 (15-21 May). The Alzheimer’s Society aims to raise awareness of dementia and the help that is available to those living with dementia with it’s 2016 campaign. Exercise in all forms is very important for physical and mental health. It can improve quality of life for people in all stages of dementia. Swimming is a sport which is in a unique position to do this, as it helps to reduce anxiety, improve mood and enhance psychological wellbeing. The ASA has been working to improve the experience of people with dementia and their carers at swimming pools across the county with the Dementia Friendly Swimming Project. The project works with pool operators to make changes to their facility to make it more accessible to people with Dementia. 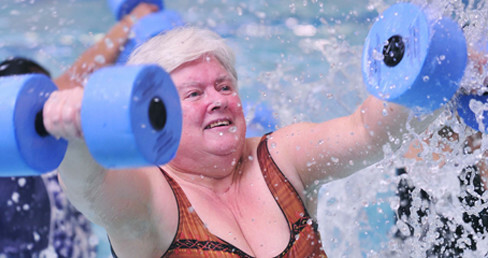 Find out more about the ASA’s Dementia Friendly Swimming Project. Last week the ASA launched our Health Commission for Swimming, an independent group of experts from various health and physical activity sectors. The group will explore current research around health and swimming, and provide evidence about how swimming positively impacts on a person’s physical and mental wellbeing. This launch follows recent approval by the NHS Research Ethics Committee for further research to be conducted into the links between swimming and quality of life for people living with dementia. Find out more about the Health Commission for Swimming. The Alzheimer’s Society encourages people across the country to hold Dementia Awareness Week activities. These include events, awareness days and fundraising activities. You can organise your own fundraising activity or run a Dementia Friends session too if you want to get involved. On Wednesday 18 May, there is an Ageing Well event at Wythenshawe Forum. The event is being supported by the ASA’s Dementia Friendly Swimming Project, as part of Dementia Awareness Week 2016. The event runs from 10am-4pm and has a focus on dementia support services and general health and wellbeing in older age. Activities include walking football, arts and crafts, dementia-friendly swimming and more. Find out more about the Ageing Well event on the Wythenshawe Forum website. On Thursday 19 May there is a Living Well Day event at the K2 Leisure Centre in Crawley. It offers a selection of free taster sessions in a number of activities for people aged 50 and over. These activities include Tai Chi, Pilates, cycling, bowls and more. There will also be the launch of the ASA’s Dementia Friendly Swimming Project in Crawley. This will be attended by the Health Minister, Jane Ellison MP. For more information about the event, call 01293 585317 or email dfc@crawley.gov.uk. The Alzheimer’s Society’s Dementia Awareness Week 2016 campaign is asking people to confront dementia. They can do this by sharing messages to dementia on social media. These will help show people who are worried about dementia that they are not alone. They have created some templates which you can share on social media with a message to dementia. This aims to raise awareness of dementia across the country and encourage people to seek advice if they are worried about themselves or a loved one. Find out more about the Dementia Awareness Week campaign on the Alzheimer’s Society website.